eg blueberries, raspberries and strawberries. Chopped large. 1. Preheat the oven to 180C (fan 160C), 350F, Gas Mark 4. Line a large baking sheet with parchment paper. 2. Pour the egg whites and maple syrup into a bowl set over a pan of simmering water. Using an electric hand whisk, whisk the mixture for 4-5 minutes until white, glossy and thick enough to form a stiff peak. 3. Remove from the heat and stir the vanilla extract and coconut in to form a stiff mixture. 4. Divide evenly into 12 pieces (about 40g each) and pressing the mixture together well, shape each one into a nest with a centre dip. Working with slightly wet hands will help if things are getting a bit messy or sticky. Arrange spaced apart on the prepared baking sheet. 5. Bake for 10-12 minutes until lightly crisp and golden. Leave on the tray to firm up and completely cool. These will keep in an airtight container for a couple of days. 6. When ready to serve, stir half of the lime zest into the Greek yoghurt and spoon a little into each nest. 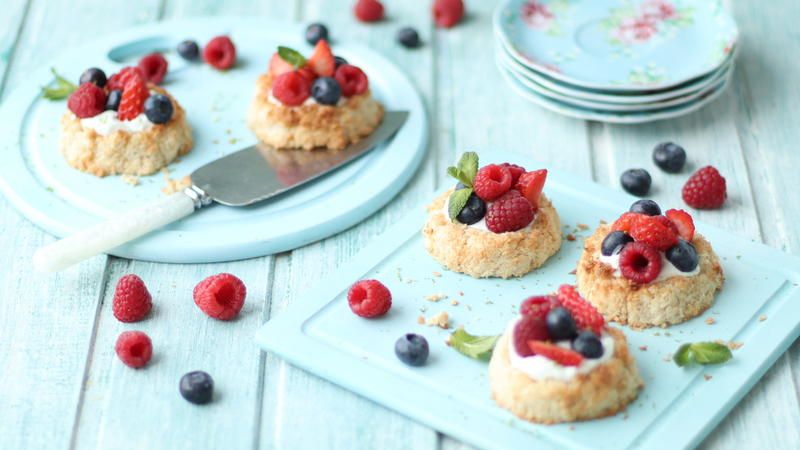 Arrange the berries on top and display on a serving board or platter. Scatter the remaining lime zest over. Decorate with fresh mint if using. Serve at once. Once, cool and firm, dip the bottoms and half way up sides of the nests in melted and cooled milk or dark chocolate and refrigerate until set.